Collection of short tutorials and help screens designed for Purdue's College of Education students and faculty. Web of Science: "Impact Factor"
4 minute tutorial on how to set up and use EBSCO folders to store your search strategies and selected references. Start by going to an EBSCO database such as ERIC or Academic Search Premier. Click the Add to folder link at the bottom of each citation. To add all items on a page, click the Share link and click Results at the top of the menu. 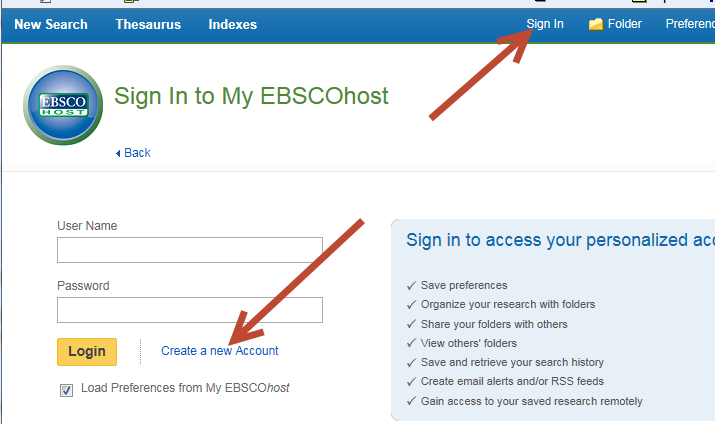 If you have custom folders created within your My EBSCOhost folder, you can specify which folder you would like your articles saved in, when you click the Add to Folder link. First go to Folders by clicking on Folder icon. Then you can print, e-mail, save, or export (to EndNote or EndNoteWeb) selected results all at the same time using the Tools in the right column. First Method: If you want to save the search strategy -- keywords and subject headings -- used in a search, so you can run the search later to update it. Click on Search History in the bar below the search windows. Then click on Save Searches / Alerts. 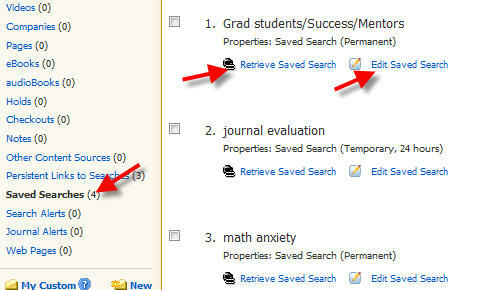 The search strategy will be kept in "MY FOLDERS" under Saved Searches . You can retrieve it to rerun it or edit it. Another Method: This method saves a Persistent Link that you can put on a webpage or in a document to rerun the search. Click on Alert/Save/ Share, and then click on Add search to folder. The search strategy will be kept in "MY FOLDERS" under Persistent Links to Searches. You can copy and paste this into a web browser and rerun the search. To share a folder with someone, (they must have a My EBSCO account) click on the yellow ‘folder’ icon, click on the folder you want to share, then click ‘share.’ Enter the email addresses, separated by semicolons, of the people you want to share with. Uncheck ‘restrict passcode to single use.’ The people you want to share with will get an email telling them how to get to the folder.